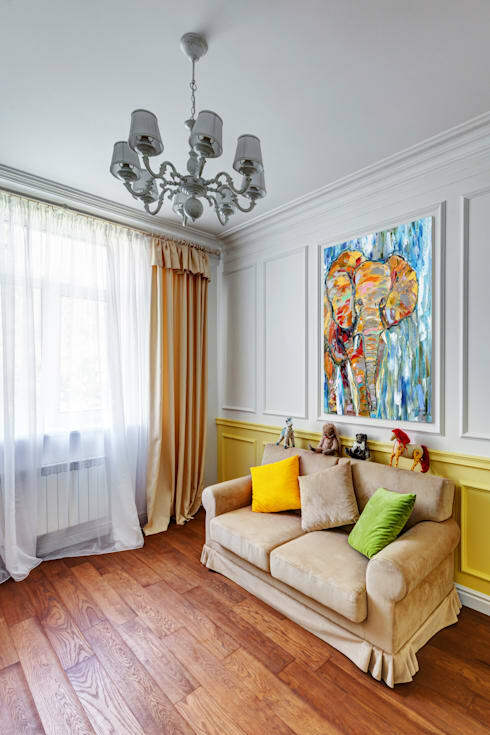 This stunning abode, located in Kiev, Ukraine, beautifully combines a classic approach to interior architecture with a raft of colourful, modern design elements, to create a home brimming with character. The brainchild of Kiev's own U-Style Design Studio, the apartment presents a series of rooms, each infused with their own unique personality through the use of striking shades, vibrant artwork and playful patterns. From the outset the effect is lively and engaging, with the home's living room hosting a boldly coloured sofa and vibrant modern artwork. 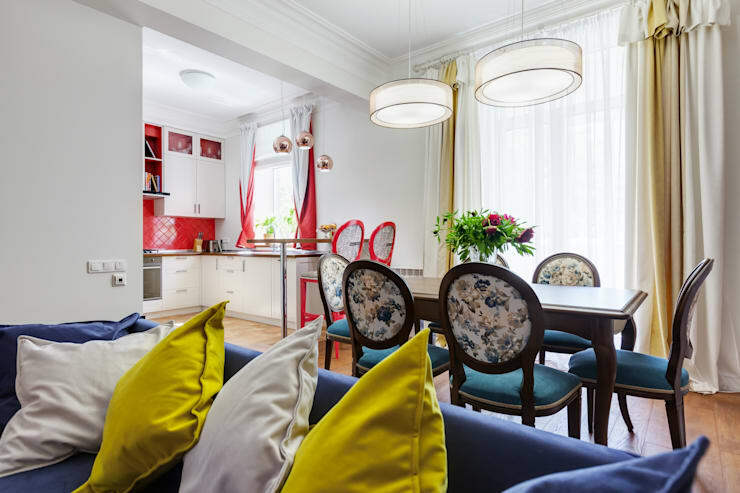 A dining setting sits adjacent, with the classic, wooden forms of its furnishings dressed up through the use of coloured and patterned upholstery, while the brilliant crimson of the kitchen glows beyond, adding another stunning shade to this home's spectrum. In the bathroom and bedroom the apartment's decor has been kept more subdued, with softer browns, blues and yellows creating a relaxed atmosphere, more suitable for bathing and rest. This home definitely inspires with its colourful style, as its decoration breathes new life and vitality into the classic shell of the apartment's construction. Take a look at the images below and see for yourself! From the outset this home presents a classically constructed abode, with the decor comprised primarily of flowing wooden floors and ornate white walls and ceilings. It's the interior decoration that makes it truly special however, with the designer having chosen to infuse each room with vibrancy and vitality through the use of bold colours, patterns and artwork. 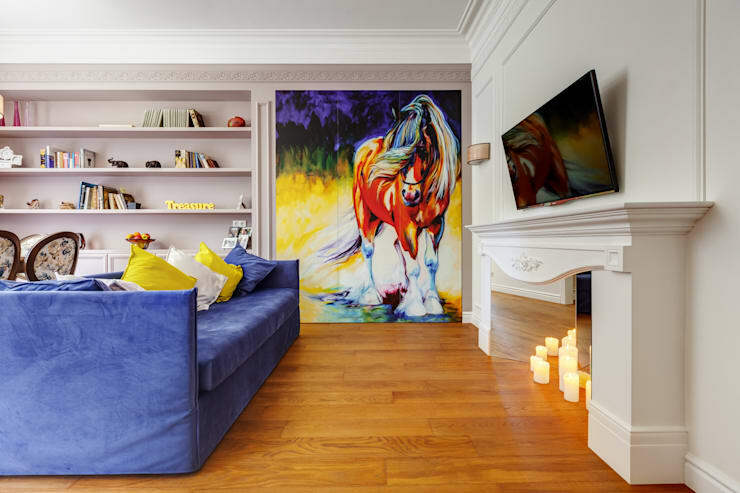 The choice of cornflower blue for the living room sofa, for example, immediately catches the eye, while the stunning modern artwork of a shy Clydesdale adds an lively sense of artistry. Adjacent to the home's colourful living room sits this lovely dining setting, combining a classic dining table and chairs in dark timber with upholstery of deep teal and blue and white florals. The darker tones of the upholstery add a more mature character to the space relatively to the lively living room, but continue the home's sense of vibrancy through the use of colour and patterns rather than muted textiles. 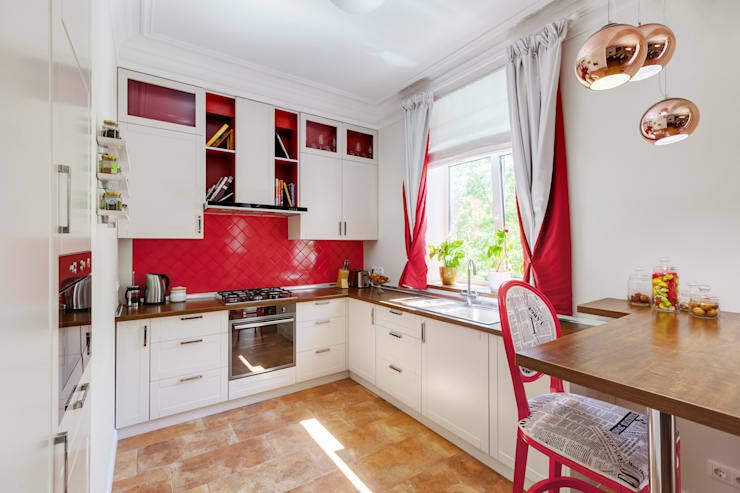 Moving through the apartment and we can see that the kitchen also retains a lively sense of character, with its white walls and cabinets interspersed with a striking array of crimson tiles, curtains and furnishings! The bright red of the bar stools seen here is amplified by the busy pattern of their upholstery, which displays a playful newspaper print. Crimson tiles and curtains complete the effect, brightening the modern, white finish of the kitchen cabinets, while wooden bench tops add a classic design material to the mix. The master bedroom is spacious and light and decorated in a more understated shade than the living, dining and kitchen areas, so as to create a relaxing atmosphere. Nonetheless, a soft yellow draws the eye from the far wall, casting a warm glow over the large bed with its patterned bedspread. 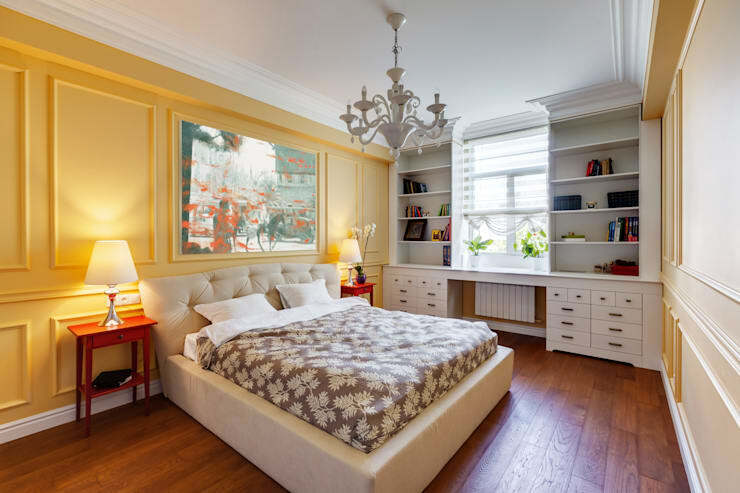 Perhaps the most impressive element of this bedroom if the plentiful storage the designers have included, with an expansive array of contemporary shelves and drawers framing the central windows, primed to display decorative objects and hide those best left out of view. 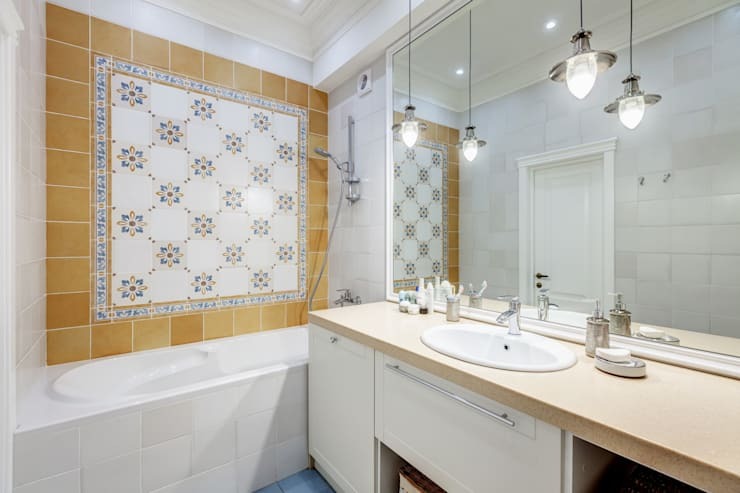 Moving through to the bathroom and we're met with a light and refreshing space, with colour and pattern included by use of a range of decorative tiles in blue, brown and white. The remainder of the decor has primarily been left white, with a large bath tub inviting relaxation and the functional sink unit housing plenty of space for storage. The final room we'll look at in this delightful home is a stunning little sitting room designed for play time with small children. The cosy couch appears comfortable and inviting and displays a range of toys to inspire creative minds, while another modern artwork, this time of an elephant, adds a sense of playful vibrancy. The room is beautifully lit, both through its large windows and by the classic light fitting overhead, creating a highly functional space that could also be used as an office or second bedroom. If you enjoy a home filled with colour and style, you should take a tour of The Magnificent and Colourful Villa Merida for design inspiration! Do you like the use of modern art seen here to infuse this apartment with vibrant colour? Tell us your opinion below!